Holcus cernuus Muhl. nom. illeg. Holcus cernuus Willd. nom. illeg. Holcus saccharatus var. technicus (Körn.) Farw. 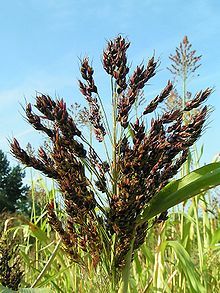 Holcus sorghum Brot. nom. illeg. Panicum frumentaceum Salisb. nom. illeg. Sorghum abyssinicum (Hack.) Chiov. nom. illeg. Sorghum glabrescens (Steud.) Schweinf. & Asch. Sorghum nervosum Chiov. nom. illeg. Sorghum pallidum Chiov. nom. illeg. Sorghum saccharatum Host nom. illeg. Sorghum saccharatum (L.) Pers. nom. illeg. Sorghum schimperi (Hack.) Chiov. nom. illeg. Sorghum vulgare Pers. nom. illeg. Sorghum bicolor, commonly called sorghum (/ˈsɔːrɡəm/) and also known as great millet, durra, jowari, or milo, is a grass species cultivated for its grain, which is used for food for humans, animal feed, and ethanol production. Sorghum originated in Africa, and is now cultivated widely in tropical and subtropical regions. Sorghum is the world's fifth-most important cereal crop after rice, wheat, maize, and barley. S. bicolor is typically an annual, but some cultivars are perennial. It grows in clumps that may reach over 4 m high. The grain is small, ranging from 2 to 4 mm in diameter. Sweet sorghums are sorghum cultivars that are primarily grown for forage, syrup production, and ethanol; they are taller than those grown for grain. S. bicolor is the cultivated species of sorghum; its wild relatives make up the botanical genus Sorghum. Sorghum with a recurved peduncle trait, Turpan basin, Xinjiang, China In some varieties and in certain conditions, the heavy panicle will make the young soft peduncle bend, which then will lignify in this position. Combined with awned inflorescence, this forms a two-fold defence against birds. It has a very large root-to-leaf surface area ratio. In times of drought, it rolls its leaves to lessen water loss by transpiration. If drought continues, it goes into dormancy rather than dying. Its leaves are protected by a waxy cuticle. It uses C4 carbon fixation thus using only a third the amount of water that C3 plants require. Richard Pankhurst reports (citing Augustus B. Wylde) that in 19th-century Ethiopia, durra was "often the first crop sown on newly cultivated land", explaining that this cereal did not require the thorough ploughing other crops did, and its roots not only decomposed into a good fertilizer, but they also helped to break up the soil while not exhausting the subsoil. Sorghum is cultivated in many parts of the world today. In the past 50 years, the area planted with sorghum worldwide had increased 66%. In many parts of Asia and Africa, its grain is used to make flat breads that form the staple food of many cultures. The grains can also be popped in a similar fashion to popcorn. The species can be used as a source for making ethanol fuel, and in some environments may be better than maize or sugarcane, as it can grow under harsher conditions. It typically has protein levels around 9%, enabling dependent human populations to subsist on it in times of famine, in contrast to regions where maize has become the staple crop. It is also used for making a traditional corn broom. The reclaimed stalks of the sorghum plant are used to make a decorative millwork material marketed as Kirei board. Sweet sorghum syrup is known as molasses in some parts of the U.S., although it is not true molasses. In China, sorghum is known as gaoliang (高粱), and is fermented and distilled to produce one form of clear spirits known as baijiu (白酒) of which the most famous is Maotai (or Moutai). Sorghum was ground and the flour was the main alternative to wheat in northern China for a long time. In India, where it is commonly called jwaarie, jowar, jola, or jondhalaa, sorghum is one of the staple sources of nutrition. An Indian bread called bhakri, jowar roti, or jolada rotti, is prepared from this grain. In some countries, sweet sorghum stalks are used for producing biofuel by squeezing the juice and then fermenting it into ethanol. Texas A&M University in the United States is currently running trials to find the best varieties for ethanol production from sorghum leaves and stalks in the USA. In Taiwan, on the island called Kinmen, plain sorghum is made into sorghum liquor. In Korea, it is cooked with rice, or its flour is used to make cake called susu bukkumi. In Australia, South America, and the United States, sorghum grain is used primarily for livestock feed and in a growing number of ethanol plants. In Central America, tortillas are sometimes made using sorghum. Although corn is the preferred grain for making tortillas, sorghum is widely used and is well accepted in Honduras. White sorghum is preferred for making tortillas. In several countries in Africa, including Zimbabwe, Burundi, Mali, Burkina Faso, Ghana, and Nigeria, sorghum of both the red and white varieties is used to make traditional opaque beer. Red sorghum imparts a pinkish-brown colour to the beer. Sorghum is one of a number of grains used as wheat substitutes in gluten-free recipes and products. It is used in feed and pasturage for livestock. Its use is limited, however, because the starch and protein in sorghum is more difficult for animals to digest than the starches and protein in corn. Research is being done to find a process that will predigest the grain. One study on cattle showed that steam-flaked sorghum was preferable to dry-rolled sorghum because it improved daily weight gain. In hogs, sorghum has been shown to be a more efficient feed choice than corn when both grains were processed in the same way. The introduction of improved varieties, along with improved management practices, has helped to increase sorghum productivity. In India, productivity increases are thought to have freed up six million hectares of land. The International Crops Research Institute for the Semi-Arid Tropics in collaboration with partners produces improved varieties of crops including sorghum. Some 194 improved cultivars of sorghum from the institute have been released. Research is being conducted to develop a genetic cross that will make the plant more tolerant to colder temperatures and to unravel the drought tolerance mechanisms, since it is native to tropical climates. In the United States, this is important because the cost of corn was steadily increasing due to its use in ethanol production for addition to gasoline. Sorghum silage can be used as a replacement of corn silage in the diet for dairy cattle. More research has found that sorghum has higher nutritional value compared to corn when feeding dairy cattle, and the type of processing is also essential in harvesting the grain's maximum nutrition. Feeding steam-flaked sorghum showed an increase in milk production when compared to dry-rolling. Additional research is being done on sorghum as a potential food source to meet the increasing global food demand. Sorghum is resistant to drought- and heat-related stress. The genetic diversity between subspecies of sorghum makes it more resistant to pests and pathogens than other less diverse food sources. In addition, it is highly efficient in converting solar energy to chemical energy, and also in use of water. All of these characteristics make it a promising candidate to help meet the increasing global food demand. As such, many groups around the world are pursuing research initiatives around sorghum (specifically Sorghum bicolor): Purdue University, HudsonAlpha Institute for Biotechnology, Danforth Plant Science Center, the University of Nebraska, and the University of Queensland  among others. Queensland University is involved with pre-breeding activities, which are extremely successful and still are in progress using crop wild relatives as donors along with popular varieties as recipients to make sorghum more resistant to biotic stresses. Another research application of sorghum is as a biofuel. Sweet sorghum has a high sugar content in its stalk, which can be turned into ethanol. The biomass can be burned and turned into charcoal, syn-gas, and bio-oil. The genome of S. bicolor was sequenced between 2005 and 2007. Sorghum is a host of the parasitic plant Striga hermonthica. This parasite is a devastating pest on the crop. The European corn borer (Ostrinia nubilalis) was introduced to North America by transport of infested sorghum broom corn. ^ "Sorghum bicolor". Natural Resources Conservation Service PLANTS Database. USDA. Retrieved 2 February 2016. ^ Dillon, Sally L.; Shapter, Frances M.; Henry, Robert J.; et al. (1 September 2007). "Domestication to Crop Improvement: Genetic Resources for Sorghum and Saccharum (Andropogoneae)". Annals of Botany. 100 (5): 975–989. doi:10.1093/aob/mcm192. PMC 2759214. PMID 17766842. ^ a b c "Grassland Index: Sorghum bicolor (L.) Moench". ^ "Sweet Sorghum". Sweet Sorghum Ethanol Producers. Retrieved 13 November 2012. ^ a b c d Jeri Stroade; Michael Boland & Mykel Taylor. "AGMRC Sorghum profile". ^ Richard Pankhurst, Economic History of Ethiopia (Addis Ababa: Haile Selassie I University, 1968), p. 193. ^ O P Sharma (1993). Plant Taxonomy. Tata McGraw-Hill. p. 439. ISBN 978-0-07-460373-4. ^ National Research Council (1996-02-14). "Sorghum". Lost Crops of Africa: Volume I: Grains. National Academies Press. ISBN 978-0-309-04990-0. Retrieved 2008-07-18. ^ "How to make a broom". Ogden Publications, Inc. Retrieved 2010-03-16. ^ "Sweet Sorghum : A New "Smart Biofuel Crop". agribusinessweek.com. 30 June 2008. Archived from the original on 27 May 2015. 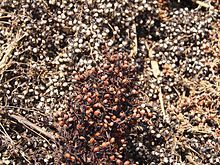 ^ "Ceres and Texas A&M to Develop and Market High-Biomass Sorghum for Biofuels (Texas A&M University System Agriculture Program)". gnewsarchive.tamu.edu. 1 October 2007. Archived from the original on 24 July 2008. ^ a b "Sorghum and millets in human nutrition". www.fao.org. Retrieved 2017-04-05. ^ Sorghum, a crop of substance Archived 2016-01-20 at the Wayback Machine. Downloaded 16 March 2014. ^ "Sorghum Research Showing Promise". Oklahoma Farm Report. 23 February 2011. ^ Ogbaga, Chukwuma C.; Stepien, Piotr; Johnson, Giles N. (October 2014). "Sorghum (Sorghum bicolor) varieties adopt strongly contrasting strategies in response to drought". Physiologia Plantarum. 152 (2): 389–401. doi:10.1111/ppl.12196. PMID 24666264. ^ a b Micheal J. Brouk & Brent Bean (2010). Sorghum in Dairy Cattle Production Feeding Guide (PDF). ^ a b c "HudsonAlpha and collaborators expand sorghum research program - HudsonAlpha Institute for Biotechnology". HudsonAlpha Institute for Biotechnology. 2017-01-25. Retrieved 2017-03-02. ^ Communications, Purdue Agricultural. "Purdue leading research using advanced technologies to better grow sorghum as biofuel - Purdue University". www.purdue.edu. Retrieved 2017-03-02. ^ Network, University of Nebraska-Lincoln | Web Developer. "Sweet Sorghum Research | Department of Agronomy and Horticulture | University of Nebraska–Lincoln". agronomy.unl.edu. Retrieved 2017-03-02. ^ "Our sorghum pre-breeding program | OZ Sorghum". OZ Sorghum. Retrieved 2018-08-10. ^ Paterson, Andrew H.; John E. Bowers; Remy Bruggmann; et al. (2009-01-29). "The Sorghum bicolor genome and the diversification of grasses". Nature. 457 (7229): 551–556. Bibcode:2009Natur.457..551P. doi:10.1038/nature07723. ISSN 0028-0836. PMID 19189423. ^ Yoshida, Satoko; Maruyama, Shinichiro; Nozaki, Hisayoshi; Shirasu, Ken (28 May 2010). "Horizontal Gene Transfer by the Parasitic Plant Stiga hermanthica". Science. 328 (5982): 1128. Bibcode:2010Sci...328.1128Y. doi:10.1126/science.1187145. PMID 20508124. ^ "Plant and Soil Sciences eLibrary". passel.unl.edu. Retrieved 2017-11-13. Wikimedia Commons has media related to Sorghum bicolor. "Taxon: Sorghum bicolor (L.) Moench subsp. bicolor - information from National Plant Germplasm System/GRIN". Germplasm Resources Information Network (GRIN): GRIN Taxonomy for Plants. Beltsville Area, USA: United States Department of Agriculture Agricultural Research Service. 2008-03-05. Retrieved 2008-12-12. Sorghum bicolor in West African plants – A Photo Guide. This page was last edited on 28 February 2019, at 15:42 (UTC).